A/V > NME 2013 > A1 - New Media Publishing: Whither the Textbook? How has the proliferation of digital media reshaped the traditional academic publishing paradigm, and how can faculty use these emerging technologies to teach more effectively? Our panelists will recount their experiences developing and teaching with new media texts. Grant Ackerman will speak about the Business School's integration of iPads in the MBA program and their use of the iBook as an extended learning resource. Dr. Paulette Bernd will discuss the iPad dissection manual she developed for use in the Gross Anatomy laboratory. Mark Newton will talk about how CDRS' partners with Columbia faculty to implement innovative digital tools and publishing platforms for content delivery and preservation. One of the exciting aspects of e-books and the newer standards for them is the ability content creators have to create a format that provides for accessibility for everyone. From individuals who are visually impaired to those that have cognitive or learning disabilities, all can all be accommodated with the latest dizzying array of devices that support a variety of functionality and multimedia. In this webinar you will learn about new and emerging technologies to provide universal accessibility, including built-in accessibility for textbooks and an open source platform. Registration closes on April 10, 2013 at 12:00 pm Eastern. Jorum is a Jisc funded Service in Development in UK Further and Higher Education, to collect and share learning and teaching materials, allowing their reuse and repurposing. This free online repository service forms a key part of the Jisc Information Environment, and is intended to become part of the wider landscape of repositories being developed institutionally, locally, regionally or across subject areas. We use a modified version of DSpace for Jorum. Jorum is run by Mimas, based at the University of Manchester. The word ‘Jorum’ is of Biblical origin and means a collecting (or drinking) bowl. I am greatly interested in learning of your interests and preferences with regard to topics as they relate to Digital Textbooks for posting of news items on the _DT > Digital Textbooks_ blog (http://digital-textbooks.blogspot.com/). Please Note > All responses are anonymous and will only be used to set posting priorities. Thanks for your assistance ! Launched in the beginning of February 2013 by Van Schaik, and using Ingram’s VitalSource Bookshelf platform, the electronic academic textbook – known as the e-Textbook – is a direct response to students’ evolving needs and is selling beyond the business’s expectations. All that one requires to read an e-Textbook is hardware that can connect to the internet and the free VitalSource Bookshelf App available for Windows, Mac, Android and iOS if one wants to access it offline. The e-Texts allow for multiple functionalities, such as highlighting, inserting notes, searching texts and sharing notes with friends. You can subscribe to your friends and lecturers, and "follow" them as they make their own notes and highlights, and even search through their notes. Students are able to access their e-Textbook and notes anywhere using their ‘myVanSchaikBookshelf’ Vitalsource account. Therefore, students are not limited to reading their e-Textbook on the PC or device that they originally downloaded it on. With the e-book industries making it seem like print copies are on the verge of fading into history, the e-Textbook has made the chance ever more plausible. With the e-Textbook available in 17 languages and with more than 1.5 million users on 6 000 campuses worldwide, the initiative is surely a successful one thus far, and seems unlikely to peter out anytime soon. Nashville, TN – Vital Source Technologies, Inc., Ingram Content Group’s leading e-textbook solution for publishers, academic institutions, and students, today announced that sixty new publishers have added more than 35,000 new digital textbooks and online course materials to its VitalSource Bookshelf® platform. "The students of today are using technology to their advantage, and we are experiencing significant growth in the number of publisher, institutional, and reseller customers using the VitalSource Bookshelf platform," said Kent Freeman, Chief Operating Officer, Vital Source Technologies, Inc. "We will continue to nurture our publisher relationships and expand and diversify our title selection to provide the digital content that's in demand by students and educators worldwide." The most recent publishers using the VitalSource platform to reach the education market include fourteen of the most recognized university presses. In addition, publishers that specialize in medical, scientific, law, religion, general trade, and standards-based education content have committed titles to the platform. These newest publishers join Cengage Learning, Elsevier, Wiley, McGraw-Hill, and more than 200 other publishers that currently make content available through VitalSource Bookshelf. "As institutions around the world continue to move to digital learning environments, working with Ingram's VitalSource platform gives us the tools to easily expand the reach of our titles to the broader education community," said Jed Lyons, President & CEO, Rowman & Littlefield Publishing Group, Inc. "As more schools reshape and enhance their curriculums for today’s student with digital content and technology from Vital Source, more Rowman & Littlefield titles will be available to those that want them." IU's e-text program, with nearly 10,000 students using digital textbooks, offers lessons learned for other universities. While Wheeler's intuition about the explosion of tablets -- 15 months before Apple released its first iPad -- was spot on, his real concern was how the university would manage content on these devices. Just as important, he was concerned about the prices students would have to pay for this digital content. At the time, textbook publishers were keen to control their lucrative textbook price margins, as it was clear education was going digital, Wheeler said. Publishers saw digital as a way of dealing with the used-textbook aftermarket, which had begun to cut into their business, he added. An ancillary problem was technological, as every publisher at the time dreamed of using its own platform for its own digital titles. "This would have been a support and [digital rights management] nightmare," Wheeler said. "We wanted to get ahead of that," Wheeler explained, adding he wanted to use a wholesale, site-license model, which IU had successfully done with software companies years before. "We cut one of the first big [license deals] with Microsoft in 1998, and cut the first deal with Adobe in 2008," Wheeler said. Under the Adobe license, for instance, IU students have access to virtually every Adobe software product. Wary at first, publishers have been receptive to IU's overtures, said Wheeler, who has inked deals with four of the five largest textbook publishers to date, and is close on the fifth. The e-texts deals also include online simulations, tutors and labs. Neuro-Cloud.net is an Open Data-Share Platform designed to foster transparency, the free exchange of data and open collaboration in neuroscience and outreach to communities interested in the brain. Due to the time expense and manpower needed to publish in a standard journal, a lot of good data stays on the shelf unpublished. Neuro-cloud takes advantage of credible pre-print archives to establish precedent and encourage citations for use in future grants/research. This gives smaller datasets a means of distribution and fosters collaboration by facilitating ratings, comments and emails for investigators. Open access publishing (OA) is a movement to make scholarly articles free and readily available to the public through the internet. OA is a departure from the traditional print journal business model in that revenue does not come from subscriptions. Because OA publishers are web-based, they are able to operate on alternative revenues such as author’s fees which research funders often allow to be included in grants. Because access is free, articles in OA journals are easy to find and cite, and since Google Scholar and other search engines are becoming more common starting places for research than libraries OA articles enjoy the same visibility as the articles in traditional high impact print journals. More specific to the Neuro-cloud project is the emergence of OA pre-print archives that allow researchers to share data and preliminary findings to the scientific community prior to peer reviewed publication. These archives allow for establishment of precedent as well as early feedback to guide and improve research. Neuro-cloud goes a step further by putting small data sets and research without a feasible outlet for publication in a streamlined and easy to read format. In this way good solid research that does not meet the criteria for immediate publication is given a platform for distribution, expansion and collaboration. Schools have to navigate a maze of file formats and compatibility issues that can arise from using digital content in the classroom. The federal Education Department has called for schools to use digital textbooks within the next five years, but what does that mean for school leaders? For one thing, it means figuring out how to deal with a number of challenges, including—but not limited to—ensuring equitable access, overcoming budget constraints, choosing preferred device and textbook platforms, and building infrastructure and capability. In Part 1 of our series on digital textbooks, we looked at what textbooks are available to K-12 schools in digital format. Part 2 examines how a few forward-thinking districts are using these new instructional tools—while overcoming many hurdles in the process. State laws and policies lag behind changes in technology and its use in schools. Content is vetted in ways that discourage publishers from competing in the market and eliminates many potentially useful materials. There is insufficient access to technology and technical support in schools and homes for a fully equitable shift to digital content in many states and districts. The business model for instructional materials prevents innovation because of its age. First off, this is not the website for Flat World Knowledge. You can get to them at flatworldknowledge.com. Instead, this is the archive of a small project by Andy Schmitz to archive Creative Commons-licensed copies of all the Flat World Knowledge books which were available online at the end of 2012. Because the books were still available under a Creative Commons license at the end of 2012, I downloaded them to have copies known to be available under a Creative Commons license. I then repackaged them so that they are available outside of the Flat World Knowledge website, and can be used by anyone under the terms of their Creative Commons license. The Open Professionals Education Network (OPEN), funded by the Bill & Melinda Gates Foundation, has created free services aligned with the U.S. Department of Labor’s grant requirements and designed to support your project. Our partners’ long-standing experience in these noted service areas can help you achieve your project goals while minimizing time and resources spent. Students, instructors and institutions aren’t afraid of digital. Publishers are. Is it any wonder that digital textbooks haven’t been widely embraced yet? Most digital textbooks are just overpriced, static versions of their printed counterparts. That hasn’t stopped the hype about digital textbooks. On one hand, it’s the promise of a new learning experience, with spinning molecules and interactive modules. On the other, it’s the long-awaited solution to the industry’s painful pricing practices. Maybe even both, if we dare to dream it. The technology and platforms are available today. So, is it that students prefer printed textbooks? Some do, sure. But those numbers are declining year after year. My contention is that students have yet to be offered a good product for a good value. A printed book rendered on a computer screen is not what we imagine the Digital Promise to be. The opportunity exists to completely rethink the product. In October 2012, the government of British Columbia announced its support for the creation of open textbooks for the 40 highest-impact first-and second-year courses in the province’s public post-secondary system. BCcampus was tasked with co-ordinating the project because of our 10-year experience with the Online Program Development Fund. The texts will be available for free online, or at low-cost for printed versions, to approximately 200,000 students. This site, Opening Education, originally brought together individuals interested in learning about and experiencing open educational practices, building on the conversations begun at the Vancouver Opening Education event in 2011, and continued at our Open Education Forum 2012. We are now using Opening Education to engage B.C. faculty, institutions and publishers to implement the Open Textbook Project. Here is where we provide our stakeholders with information, meeting notes, progress reports, events and workshops on open educational resources in general, and the Open Textbook Project in particular. Open educational resources made a dramatic appearance with the 2002 debut of MIT's Open Courseware initiative. In the roughly 10 years since, OERs have not noticeably disrupted the traditional business model of higher education or affected daily teaching approaches at most institutions. Four major hurdles seem the likeliest hindrances to adoption of OERs: discoverability, quality control, bridging the last mile, and acquisition. When MIT first announced its Open Courseware (OCW) initiative in October 2002, it shook the business model of traditional higher education institutions that had established "virtual universities" in an attempt to sell their brand and their educational resources worldwide. With OCW, MIT sent a signal: we don't sell learning resources, we sell certification of learning; learning resources do not have much intrinsic monetary value, but a degree does. This was arguably the first disruption of the higher education market in decades, marking the birth of the open educational resource (OER). Fast-forward to October 2012: OERs have failed to significantly affect the day-to-day teaching of the vast majority of higher education institutions. Traditional textbooks and readings still dominate most teaching venues even though essentially all students are online: Course management systems are used only for the dissemination of syllabi, class notes, general communications, and as a grade book. OERs are out there…somewhere. Why aren't they on campus? UC Berkeley students in the campus’s School of Information are collaborating to enhance the efficiency of e-books in the hopes of revolutionizing the accessibility of information among researchers and the general public. According to Master of Information Management and Systems (MIMS) student Jacob Hartnell, research on e-books will improve an inefficient system that is “app-based” instead of “Web-based.” He noted that existing e-books viewed on one device are often viewed differently or cannot be viewed at all on another device. Hartnell and his team aim to harness a web-based platform, using the standardized Web language of HTML5, to create e-books as an alternative to private proprietary formats like Kindle and iBook. Hartnell also added that making e-books available for viewing via the Web would allow for collaboration between authors, publishers and editors. Cheap e-textbooks are slowly making their way to colleges, but e-book savings are only one of many good reasons for undergrads to be packing an iPad. If a 16GB Wifi-only iPad costs $500, and a student spends $1,000 per year on printed textbooks while recouping 16 percent on the sellback, and an e-textbook costs 60 percent less than a printed textbook but lacks sellback, and only 32 percent of a college's textbooks are e-textbooks, how long before the iPad pays for itself? Answer: It'll take you around three-and-a-half years to recoup the cost of the iPad solely from e-textbook savings. Hopefully, time to return on investment will shorten as more universities and educational publishers get on board with e-textbooks. One of the universities leading the charge is the University of Indiana, which just announced that nearly 10,000 students are using e-textbooks this spring semester. "IU has long saved students money by negotiating favorable pricing for software, and it is natural to negotiate favorable pricing for digital textbooks to reduce the costs of attendance," said University of Indiana's CIO and Vice President for IT Brad Wheeler. The University of Indiana began piloting e-textbooks four years ago. The spring semester now has 250 course sections using e-textbooks, which the university claims results in $200,000 in collective savings. Best of all, University of Indiana students won't have to stuff a backpack with a bunch of heavy books and lug them around campus. E-textbooks. Hybrid and online courses. Using learner analytics to assess experiments that involve academic technology. The future of SmartSite. These are a few of the areas that David Levin intends to discuss, and address, as director of Academic Technology Services for Information and Educational Technology. Another important initiative we’re going to think about this year, and the next year or so, is e-text and e-content. E-books have taken off. Some publishers announced last year that their e-sales had outpaced their physical sales. In other cases it’s well over 30 percent. On the other hand, e-textbook sales are lingering around 1 or 2 percent of the sales of textbooks. What can we do about that here? Good question. I think that’s going to change. We need to think about whether we want to change that, how we can change that, what are the stumbling blocks, and what are the models to make it work. One reason why it hasn’t changed yet, maybe, is that it’s not high stakes. If I read my latest novel or something online, rather than in print, it’s easier for me to access, it isn’t necessarily tied to a particular device—there are all kinds of advantages. Now look at the learning space. A lot of work has been done on understanding how students read a textbook. It involves teaching people how to find, highlight and annotate the important parts of a textbook. How well people read things is important to how well they do. We’ve done a lot with the textbook, to help students read textbooks well, with images and tables put on a page so that they can understand the concepts. We’ve designed our physical textbooks really well. Maybe a problem in moving to an e-textbook world is, how do we make sure we design the e-textbook for learning success? The point is, we’re very good at showing people how to use physical textbooks, and maybe that format doesn’t translate easily to e-text? I’m not sure. I guess I’m saying yes. We have to be very cognizant—as we think how to move to an e-textbook world, and why it’s going slowly—that we are very, very concerned that our students succeed in their learning. The move to an e-text world is a cultural shift, and we have to design things so they will lead to student success. I believe that e-texts actually hold the promise for greater learning than physical textbooks, but we have to think carefully about it. Some of the early results are mixed. At California State University, Northridge, we started some studies with e-texts, and frankly, in the early data, the students who were engaging the e-text were not doing as well as the students were engaging with the physical text. If you open a well-designed textbook, it’s so different from a novel. A novel is a bunch of words in an order. A textbook has tables, inserts about cases, and all kinds of things. I think you could make an e-textbook even better. 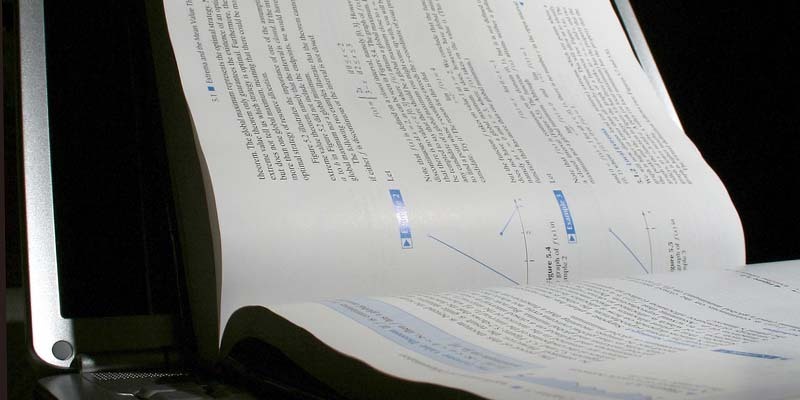 In a physical textbook, you can imbed an image, even a beautiful glossy image. In an e-textbook, you can imbed a video, or a link to the author explaining something. And it can be designed so that the student can dig down as deep as they want, or where they want. You can almost make it a find-your-own-textbook, or find-your-own-adventure-through-the-textbook, or things like that. There lots of ways that it can be better, but we haven’t found them yet. We need to work on finding them. The textbook, like any text in a sense, is a very individual and isolating thing. As I’m reading this chemistry text, I need to learn the important points. There are all kinds of clues. I have to figure out what is worth that yellow highlighter, and what annotations are valuable. With an e-text, especially a network-based e-text, you can make it a social environment, so that I can ask people in my class what the problems are. It can be designed so the instructor can look in and see, if the students are willing, what problems the students are having. It could take on the qualities of a wiki. A wiki, a discussion board, all kinds of different things. It can take on ‘phone-a-friend’—you could have a tool so that a student who is having problems with a particular portion can ask the instructor or a TA. They can send a question to anyone in the class, anyone in the university, anyone reading the book. If the textbook is being used enough, chances are other people are reading this very passage at this very time. Can I send out a message to all of them, saying, ‘I didn’t get this’? That not only helps the person who is asking the question—the other student in New York who is reading that, and believes they understand it well, will understand it even better if they explain it to somebody else. Is this discussion about e-texts one you want to have on campus? Oh yeah. It’s tied in to so many of the areas we’ve been talking about. I think where we want to go with e-text is critical. We’ve got to learn how to do it, and there are significant challenges in our thinking about how to do it. I imagine you welcome faculty who want to talk with you about all this? When Natalie Sarrazin teaches her course about music and the child at The College at Brockport in the fall, she plans to save her students some money by using an online textbook she is now writing. Sarrazin, who is an associate professor of music, is one of the faculty members at State University of New York colleges who are participating in the Open SUNY Textbook project — an initiative to have faculty members write 15 online textbooks, which students or anyone else can use free of charge. \In Sarrazin’s case, she expects her textbook to be used for her course instead of a hardcover one that sells for $220. She is convinced that the textbook will better be able to address the needs of her students. “It will be more topical,” said Sarrazin, whose course shows how music can be used in elementary school to teach such other subjects as science by, for example, playing different kinds of music to help explain the different states of water. The Open SUNY Textbook initiative was organized by Cyril Oberlander, who is the library director at the State University College at Geneseo, and is part of a nationwide movement by various educators and consumer advocates to create online textbooks. “Everybody recognizes the potential to use digital technology to reduce the costs of textbooks,” said Nicole Allen, an expert on textbooks for U.S. PIRG, which is the umbrella group for various public interest research groups. The eTextbook market has been a subject of interest for educators, publishers, distributors, tech companies and students alike. In 2011, the higher education market for eTextbooks grew 44% to $267 million. So far, eTextbooks have claimed about 6% or so of the total textbook market share. Publishing market research firm Simba Information estimates that this will escalate to 11% in 2013.Both the public and private sectors are driving rapid adoption. All major textbook publishers have jumped on board, as have Amazon and Apple. U.S. Secretary of Education Arne Duncan has called for rapid adoption, stating that “Over the next few years, textbooks should be obsolete.” Duncan asserted that this is necessary to keeping American education competitive. The most recent PISA results found roughly 20 other countries performing significantly better in math and science than the U.S. South Korea, which consistently outperforms the U.S. academically, has set 2015 as a date for full eTextbook adoption. That the wealthiest country in the world has fallen below average in these key areas has justifiably sparked concern, but can eTextbooks help American schools? If so, what obstacles have to be overcome before we see widespread adoption? To understand where we’re heading in education and edtech, it’s important to look back at our educational roots. As we searched for some of most memorable moments and discoveries in the history of education, we found there are lots of things that haven’t changed in hundreds of years! The groundwork for clunky, physical textbooks was set by the Ancient Greeks, and in the Middle Ages, the lecture format of teaching emerged. Free digital textbooks, open online classes, and open educational resources make education more affordable and accessible for students around the globe.